The last decade witnessed a global boom in tall building construction, and, like every year since 2014, 2017 set another record for tall building construction with the completion of 144 buildings taller than 655 feet. New York City, practically synonymous with skyscrapers, saw its fair share of tall buildings erected as developers continue reaching for the sky. However, unlike most of the tall buildings going up worldwide, New York leads the way in a new trend: slender skyscrapers. The slenderness of a tower is defined by the ratio of its height to base. 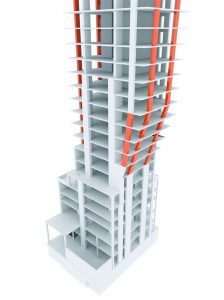 Although definitions vary, most structural engineers consider a building to be slender if its height-to-base ratio is above 10:1, with super-slender buildings having ratios as high as 24:1. By way of comparison, 1 World Trade Center has a ratio of less than 7:1. Driven by the high demand for luxury residential apartments with stellar views and the limited buildable space on which to construct, slender buildings started sprouting on the New York skyline around 2007. Mostly clustered in residential neighborhoods around Central Park, slender buildings’ stunning appearance attract attention in a noisy real estate market. In addition, slender buildings are unique in the neighborhoods in which they’re built and attract further attention, increasing demand. But why build a slender building instead of a regular tower in the first place? Most slender skyscrapers are residential buildings built in residential neighborhoods. As such, the number of parcels available for construction are limited and those available typically have a narrow width. Further, New York City zoning allows for the Transfer of Development Rights (TDR), so unused air rights from one property can be purchased and stacked on a single lot, allowing for extra-tall buildings. The tall heights and narrow footprints result in slender buildings. 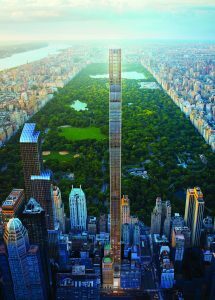 A quick survey of the New York skyline reveals a number of slender and super-slender buildings, including 30 Park Place (10:1), 100 East 53rd Street (16:1) and the soon-to-be-completed 111 West 57th Street with an incredible slenderness ratio of 24:1. One building, however, is unique in this small group of uniques: Madison Square Park Tower. At a height of 780 feet and with a slenderness ratio of 13:1, Madison Square Park Tower isn’t the tallest nor the most slender of the slender buildings. What makes this building unique is that it’s inverted, with the floors increasing in size as elevation increases. Developed by Continuum Company LLC, Madison Square Park Tower was designed by structural engineering firm DeSimone Consulting Engineers. 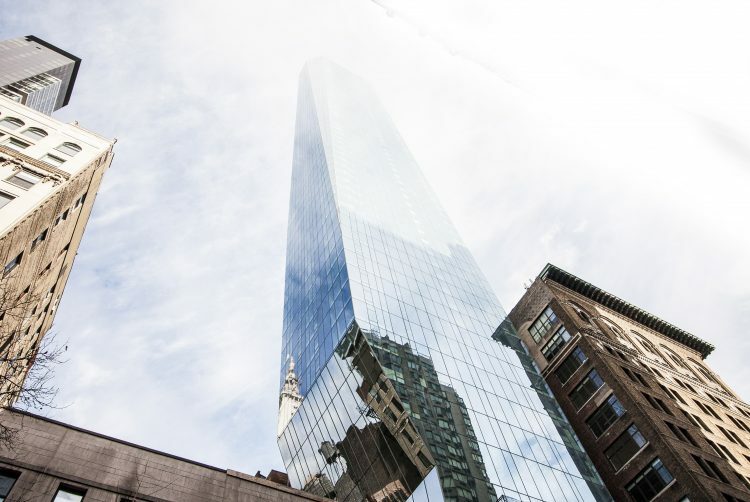 Located at 45 East 22nd Street in the Flatiron District, the tower is a 780-foot, 60-story “ultra-luxury” residential tower with floor space of 260,000 square feet. The floor plate has dimensions of only 62 feet wide by 52 feet deep. However, at the 7th floor, the building cantilevers over the adjacent building, with floor areas increasing to reach a width of 94 feet. Moving higher, the floor width steadily increases to a maximum width of 125 feet at the top floor. As the floor area at each level increases, so does the surface area of the building facade. This increasing surface area of the building facade exacerbates the already considerable design challenge associated with slender buildings: the wind. Of all the design challenges associated with building skyscrapers, handling the forces and acceleration caused by wind is the most important when designing slender buildings. For generations of structural engineers, a height-to-base ratio of 7:1 was thought to be the limit where a building is rigid enough to keep wind-loading acceleration low enough to not cause unease or motion sickness. The advent of slender buildings with their greater ratios meant designers needed to reimagine what’s structurally possible. 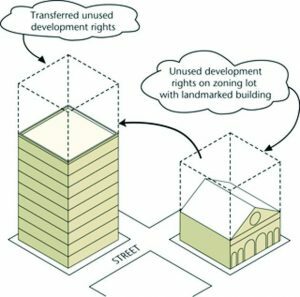 A conceptual graphic illustrates transfers of unused development rights. 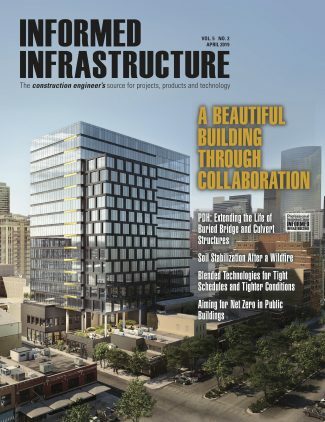 To make the building’s inevitable sway go unnoticed by occupants, DeSimone and his team focused on three main features of the structure: shape, material and dampers. Especially in residential building design, footprint and cross-sectional shape have a huge impact on the layout of floor plans. When building ultra-luxury apartments, the floorplans must be saleable. As such, it was integral for DeSimone Consulting Engineers to work closely with the project architect to develop the shape of the overall building. With the everyday experience of seeing sleek, wind-cutting automobile and aircraft designs, it might be counterintuitive to learn that buildings should not be aerodynamic. As wind moves around a building, it creates vortexes that result in lateral pressure on the structure. Using the same principle as the dimples on a golf ball, tall buildings are shaped to disrupt the vortexes and reduce the loading. With advances in structural analysis software, the prevalence of BIM and 3D modeling, and the overall ubiquity of computer simulation in the design industry, it’s not unreasonable to assume that computer simulations are used to calculate the pressures on skyscrapers. And for certain applications (e.g., cladding pressure calculations), the simulations are capable. However, computational fluid dynamics aren’t evolved enough yet for use on flexible slender buildings. Instead, the design team relied on a combination of high- and low-tech tools. With an understanding of the basics of how wind moves around a structure—and accounting for chamfers, angles and openings in the building—the team 3D-printed a 1:400-scale model of the proposed building and the area within a half mile of the project site. The model then was placed in an advanced wind tunnel in Canada (frequently used to train cargo ship pilots) to measure results. Being slender and inverted, the proposed building was getting a “double hit”: the wind pressure gradient (due to increased wind speed) increases with height and acts on an ever-increasing surface area. “The initial wind tunnel results showed an acceleration ‘off the charts,’” recalls DeSimone. Armed with modeling foam, a glue gun, an exacto knife and tape, the team experimented with different shapes, adding and subtracting from the original model to see what yielded greatest reductions in effective wind pressure. A sensitive plate recorded the bending moment at the base of the building model, which is used to calculate and quantify the benefits of shape tweaks. After three days at the windtunnel, the team developed 19 plausible structural options, which were narrowed down to the final shape based on floor plans prepared by the architectural team. 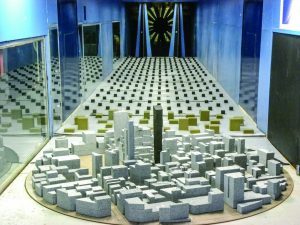 A scale model of Madison Square Park Tower and the surrounding area was placed in a wind tunnel to determine the optimal shape. Developer: Continuum Company LLC; Eichner Properties Inc.
Shaping the building is only one of the strategies needed to deliver a comfortable living environment hundreds of feet above street level. 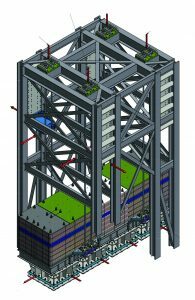 Creating a stiff, heavy, strong structure is another, and these requirements point to concrete. Adjacent to Madison Square Park Tower is an occupied six-story historic building. Sloping concrete diagonals at 23 feet on center as well as post-tensioned, thickened floor slabs at the top and bottom of the truss allow the width of the building to increase from 62 feet at its base to a maximum of 125 feet at the highest floor. Lateral loads are resisted by shear walls consisting of 14,000 psi concrete at the base, which decreases to 8,000 psi at the top levels. 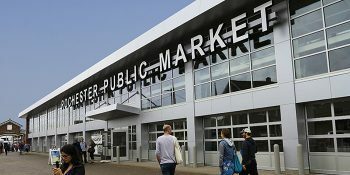 The building sits on an 8-foot-thick reinforced concrete mat anchored to the underlying 40,000 psf bedrock with 24 2-inch diameter, 60-foot-long steel anchors. A Revit model illustrates the diagonal columns used in the design. Although the 60 stories of reinforced concrete provide a large acceleration-damping effect, additional help is needed to stay below the desired acceleration range. To further decrease acceleration, the final tool deployed by DeSimone and his team is a tuned mass damper. At the top floor of Madison Square Park Tower sits a steel tuned mass damper system weighing 600 tons—a weight equivalent to 250 Cadillac Escalade SUVs! The mass of the damper attempts to stay at rest while the building tries to move beneath it. Large shock absorbers link the mass to the building structure, damping acceleration and sway. In 2004, when the Taipei 101 building opened in Taiwan, it was the world’s tallest building and had the world’s largest tuned mass damper. Rather than hide the damper along with the other mechanical equipment, as is common, it was instead made visible to the public, bringing the concept of the tuned damper to the masses. A tuned mass damper is a mechanical device that reduces the magnitude of vibrations or swaying in the building by absorbing kinetic energy. The “damping” comes from the rigidity of the connections between the mass and the building, and the “tuning” comes from the distance between the mass and the damping connections. The system thus can be tuned to the building’s resonant frequency, helping to rapidly decelerate the building when it’s subjected to strong winds. The Madison Square Park Tower tuned mass damper weighs 600 tons. A Revit model shows crown and tuned mass damper support. Years of data performance from real-world buildings now are fed into the design process and used to refine performance predictions to get much closer to actual performance. “It’s Big Data applied to structural engineering,” adds DeSimone. In fact, DeSimone Consulting Engineers recently hired a data scientist and Python programmer to help sift through all the data now available. Tuned mass damper technology also has improved in the last 10 years. Again, using real-world data, designers could validate their predictions and refine the design of the systems. This resulted in less expensive, more accurate and more widely available damping systems. 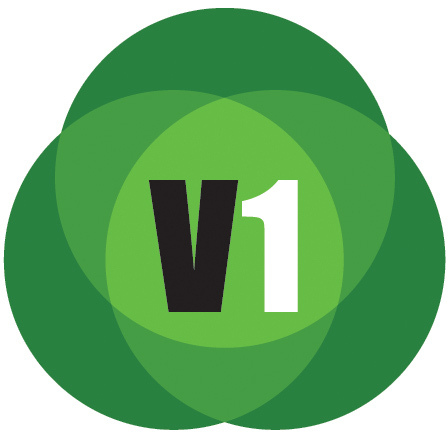 The design team used a variety of software applications. Mark Scacco, P.E., is the Editor in Residence for Informed Infrastructure magazine and since 2001 has been an AEC industry consultant. He is the president of Scacco LLC and can be reached at mark.scacco@scaccollc.com. Executive Corner: Is It Time for a Shareholders’ Agreement Tune-Up?